One of the hardest things I fight with my children about is their rooms. I can get them to do some chores around the house, but when it comes to their rooms, it is almost impossible. How do parents do this? 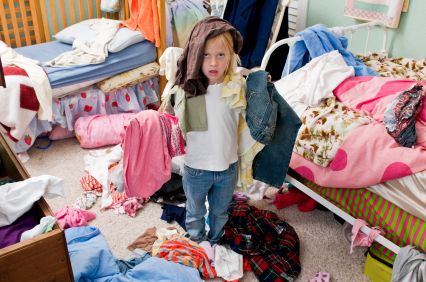 If I ask my 16-year-old to clean her room, she will. It often takes her two or three days, but it gets cleaned. My 9-year-old daughter, on the other hand, is completely different. She will avoid it for as long as she can. She will go in her room and act like she is cleaning, but she really isn’t. The best part is when she really does clean it. She will call me up there to see it. It often looks good when I first look at it, but watch out when you open the drawers or the closet. Everything has been shoved in one of these two places and this is why she can never find anything. This is something that is hard for me to deal with. Maybe this happens because I am not strict enough. I should probably give them time limits and then punish them if the work is not done, but this is just not how my brain operates. I have friends that are great at this. They tell their children to clean their rooms and their children do. The kids might grumble a little, but they get the job done. I think the key to this is consistency and consequences. I need to be more firm and then maybe they will listen better.